He labelled each of the vertices with the name of an important city. The challenge was to find a route along the edges of the dodecahedron which visited every city exactly once and returned to the start. 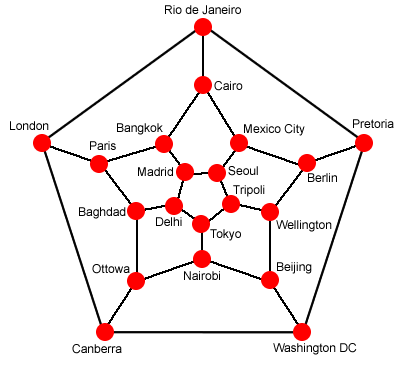 Here is a graph which represents the dodecahedron. Can you see how each of the 20 vertices, 30 edges and 12 pentagonal faces is represented in the graph? Can you find any other ways of making this journey? How many different ways are there of visiting each of these countries once and only once, beginning and ending at Australia? Mathematical reasoning & proof. Working systematically. Interlocking cubes. Networks/Graph Theory. Visualising. Investigations. Topology. Multiplication & division. Addition & subtraction. Combinations.